One October I was asked to write Easter devotions for my church. Even though it was only October, I began listening to Easter music, reading Easter stories, studying Easter symbolism, and watching Easter movies. By December, I was firmly entrenched … and completely unprepared for a collision of Easter and Christmas.In December I saw clearly the baby Jesus, so pure and lovely and vulnerable – while daily I confronted the horrors that awaited him. 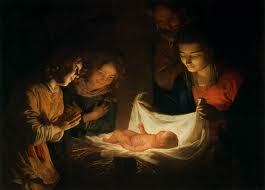 The nativity characters looked so angelic, so pleased by the new baby – while I wrote about scourges and spears. On one occasion I stopped by the nursery at church. It is hard to describe the experience of writing about those heavy 7-9 inch nails driven into the hands of Jesus – then seeing tiny baby hands. Or gazing at soft baby skin, and imaging my Savior’s soft baby skin that would one day be ripped away by a Roman scourge. I saw those sweet babies’ heads, covered in the softest of hair – while the pain and humiliation of the crown of thorns was vivid in my mind. The greatest impact of all came in late December, as I neared the end of my reading through the Bible chronologically in a year. I admit to being a little behind – OK, a lot behind. I was burning through the epistles at lightening speed, then I hit Revelation. I slowed down. I lingered. I reread parts. The last four chapters never sounded so good. 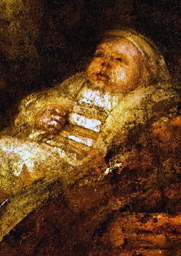 It was the ultimate victory of that sweet vulnerable baby I had just worshiped, and that beautiful Savior in whose agony I had been immersed for 10 weeks! It was the confluence of the birth, death and ultimate victory, descending on me en masse. The experience was electrifying – exhilarating. May you experience the fullness of Christmas this year. …I believe that each work of art, whether it is a work of great genius, or something very small, comes to the artist and says, “Here I am. Enflesh me. 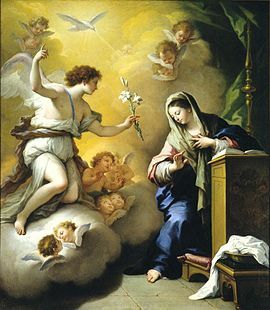 Give birth to me.” And the artist either says, “My soul doth magnify the Lord,” and willingly becomes the bearer of the work, or refuses; but the obedient response is not necessarily a conscious one, and not everyone has the humble, courageous obedience of Mary.